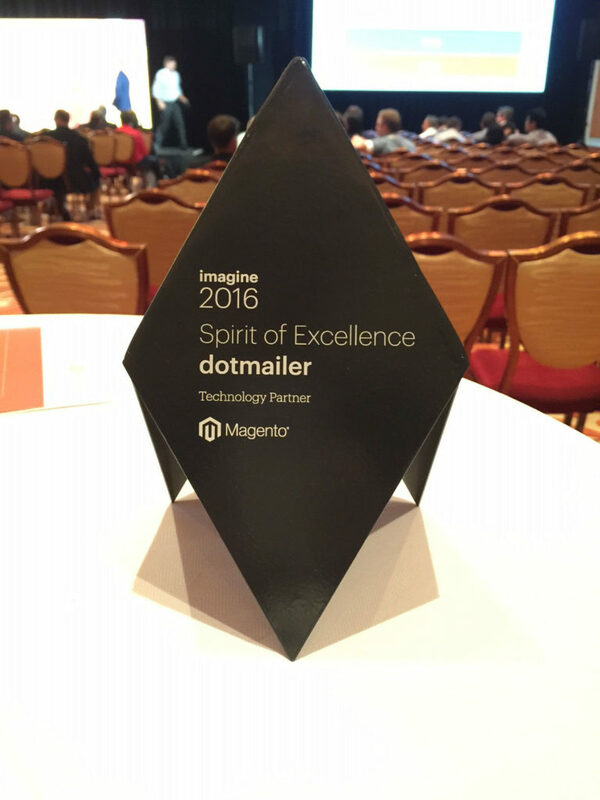 We were delighted to be a sponsor of this year’s Imagine Commerce in Vegas, and were even more thrilled to have walked away with a Magento Spirit of Excellence award. What a week! It was great to catch up with the Community, as well as our agency and tech partners and clients, at the conference. And, of course, we can’t forget the incredible Platinum Party. These last few months have been big for us also, what with the announcement of our Magento Platinum partnership in November 2015 and the transition to Premier-level partnership, revealed during this year’s Imagine. What are the Magento Partner Awards? The 2016 Magento Partner Awards recognize both solution integration and technology partners who made significant contributions to the ecommerce industry during 2015. The Spirit of Excellence award, in particular, represents outstanding quality of customer satisfaction, innovation, investment in tech enablement and promotion of the ‘ecosystem’. As a partner and advocate of the Magento ecosystem, we host regular Magento User Group Meetups at our London HQ. And our own Head of Ecommerce, Ben Staveley, serves on the Magento Marketplace Council, which meets regularly to maintain the quality and credibility of extensions. We also work closely with our clients’ agencies to drive ecommerce excellence, and were excited to see that some of those names won awards this year. Barbeques Galore, whose agency partner is Netstarter, was awarded Commerce Marketer of the Year. The Australian brand was given this accolade for maximizing its multichannel marketing across its Magento Enterprise Edition site and 100+ stores, driving a 350% increase in conversion rate and a 360% uplift in year-over-year sales. dotmailer and Redbox Digital client, Screwfix, was also given the honor of the Great Explorer Award for International Expansion. The trade tools, accessories and hardware products retailer successfully launched new business operations in Ireland and Germany, with its online business now shipping to over 20 European markets. And, last but not least, nice work to another of our partners – Blue Acorn – who also scooped a Spirit of Excellence Award! Check out Magento’s announcement release to find out more.